We are growing and need help! In more than 10 years of work specializing in the behavioral health industry, we have learned what makes the ideal software for your practice. Through tireless testing and outstanding client feedback, we offer your 3-in-1 solution: EHR, clearinghouse and billing, all in one piece of software. For private practices and large agencies alike, we are the right fit for your organization. Checkpoint EHR will never charge for adding new users. Ready to take the task of finding a clearinghouse off your plate and eliminate fees for claims scrubbing and remittances? Let the experts at Checkpoint do it for you at no extra cost. Claims are automatically processed and submitted with Checkpoint EHR, eliminating repetitive manual batching and giving you more time to serve your clients. 1.6% of revenue. That’s it. Our pricing structure makes us unique in this market. The cost of using Checkpoint EHR is simple and straightforward, covers clearinghouse fees and includes unlimited users, hands-free billing, client reminders and more. This structure automatically reduces your costs when you have those seasonal or occasional off-peak revenue months. Improvements to the software are always being developed and implemented. Our unlimited software support will make sure you continue to get the most out of your EHR platform. Doubling the claims your practice submits? When your business thrives, we come with you. Our pricing and features are designed to promote your business’s growth, not hold it back. 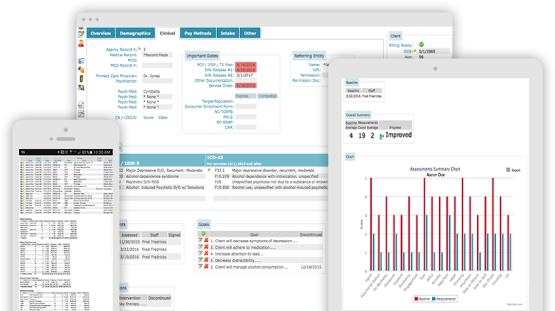 Our mission is to create and continually improve a complete EHR software that helps behavioral health professionals improve the quality of care they provide in every way possible. The extraordinary feedback we receive from our customers continually drives us. Improving client outcomes is what we all want, and when we at Checkpoint hear that our software accomplished just that, it makes our work mean that much more to us.